Learn how to prioritize requirements from Dr. Martin Schedlbauer, CBAP, OCUP. Hi, I’m Roger Jennings and I’m a trainer and consultant with Corporate Education Group. With any project, there is pressure to complete work faster and more efficiently. In turn, the requirements phase of a project is often negatively affected because there is usually nothing tangible produced for stakeholders to see, other than documentation. The process for requirements has typically been to spend large chunks of time to elicit, elicit and elicit information from the stakeholders, then analyze and organize the elicited information, create a large requirements document, and finally, present the large document to the stakeholders for review and acceptance. Unfortunately, this tactic often creates stakeholder uncertainty as they are eager to see results from all of their input. And be prepared for a number of revisions during the acceptance review. 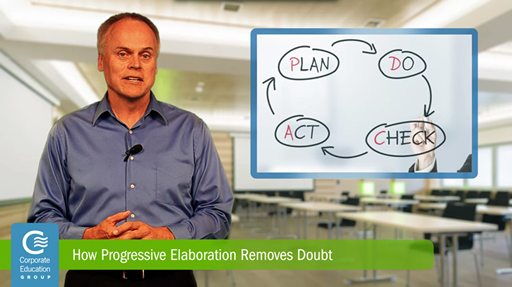 Using a progressive elaboration approach with incremental or iterative requirements development can greatly reduce this uncertainty for your stakeholders and relieve you of the added stress of numerous revisions. create an implementation plan for the gap analysis. Another technique as you move through the requirements phase, is to create and share prototypes such as screen mockups, screen navigation, reports and interfaces. These give stakeholders something tangible to see and can react with feedback. And it demonstrates progress is being made, reducing revisions at the end. Progressive elaboration with iterative requirements development breaks down the large long-term requirements phase into smaller manageable work showing progress and obtaining incremental acceptance, both removing stakeholder doubt and increasing positive outcomes for the project.